A whole bunch of my mom-friends are buzzing about Snapchat’s latest Snap Map feature that shows their teen’s avatar location on a map – right down to the cross street. Wired called it “stalkerish,” while a whole host of other news outlets from Good Housekeeping to ABC News report additional privacy concerns. When your teen opens the app for the first time after the update, Snapchat walks them through a step-by-step tutorial on how to use the Snap Map. First, it shows how to pinch and zoom in the camera tool to access the map. Next, it asks who they want to see their location. 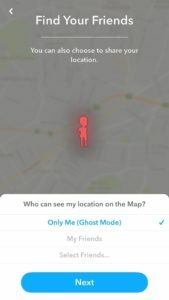 Choosing “only me” activates what Snapchat calls Ghost Mode. This makes their avatar disappear from others’ maps; they can see other friends, but no one else can see them. 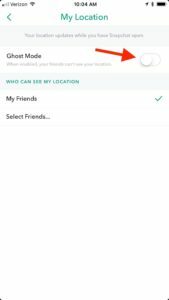 Great for stalking their crush and all, but remember, Snapchat’s all seeing, all knowing eyes (ahem, your phone’s sensors) can still track their location. 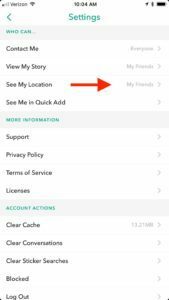 To turn off location data altogether, you’ll need to visit your phone’s settings where you can scroll down to Snapchat, click on “location,” and choose to never share. Open Snap Map -> click on the setting menu in the right hand corner -> decide who gets the privilege of tracking your every move. One word of caution though – and this comes straight from Snapchat: Warning ⚠️ Snaps you submit to Our Story can still show up on the Map, no matter what location setting you choose! 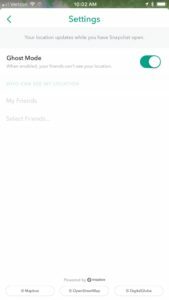 WORRIED ABOUT SNAPCHAT LOCATION TRACKING YOUR TEENS? I’M NOT. HERE’S WHY.